These are Magic brushes artworks: Beautifully hand painted wedding flutes, Personalized wedding glassware, Personalized flutes, Hand painted wine glasses, Hand painted cups, Ring pillows, Silk family flangs, Laces for glasses decoration. Each of them you can personalize and make your costumized design. 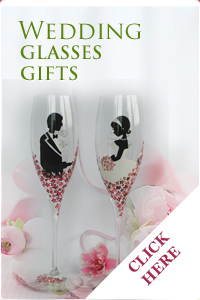 Any wedding glassware can be customized to your wedding theme. After painting, each item is fired for durability. But I recommend hand washing. If you will consider careful washing glass will be beautiful long time even using every day. We send our items worldwide and you don’t have to worry about shipping. We will pack them very carefully in boxes, foam plastic and papers.